Victoria, Mahe (Seychelles) – March 6, 2018 (travelindex.com) – The proposed military base on the island of Assumption by India continues to generate anger in the islands. This morning protesters were outside the parliament where President Danny Faure is set to deliver his State of the Nation Address this afternoon. The proposed military by India is but some 20 miles from Aldabra, the UNESCO World Heritage Site. Seychelles enjoyed a leading role in environment protection and maintained a non-aligned strategy eversince its Independence from Great Britaun in 1976. Today the pressure from India in their catchup drive with China sees Seychelles finally taking sides at the detriment of their sovereignty and independence. A military base by a super power will bting super power conflicts to their door step. 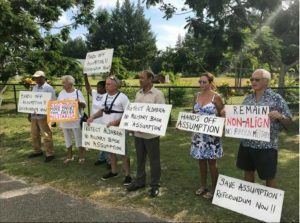 The protests in Seychelles has been ongoing and will climax this afternoon when President Faure will head to the island’s parliament to deliver his address. The world will be watching with anticipation on his decision on this Indian Military Base.